Buttercup Squash Pie Bites are a delightful dessert for holiday entertaining. 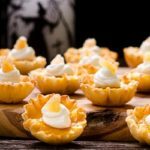 It's spiced buttercup squash in mini fillo shells topped with whipped cream. Measure 1 cup of mashed squash and place it in a large bowl. Store remaining squash in the refrigerator for other uses. Add sugar, ginger, cinnamon, salt, evaporated milk, and egg to the bowl. Stir or beat to thoroughly combine the ingredients. Place 30 fillo shells on 2 baking sheets. Spoon or ladle filling into shells. Bake each sheet of pie bites for 18 minutes, or until the center of the pie bites are set. Transfer pie bites to a wire rack and cool completely. Top pie bites with whipped cream and garnish with chopped crystallized or candied ginger. Pie bites are best on the day they are baked. The shells will soften and not be crispy if made in advance and refrigerated.